It's -2 (celsius) here today. Some people find this cold here. But it also means it's -28 in Saskatchewan. I'm terribly sorry to my fellow prairie people. I think cold weather gets me thinking more and more about Christmasy things and Christmas gifts. And I'm excited to announce that I will be taking part in an art market, which just happens to be a fantastic place to get a Christmas gift! 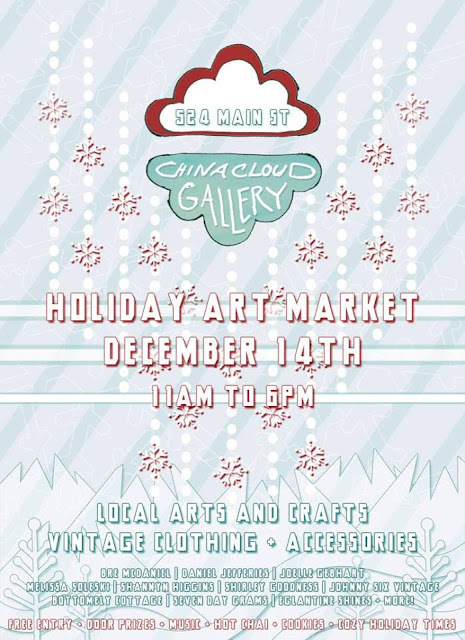 If you are in the Vancouver area (or want to travel a distance for a great show...) come on out to the China Cloud Gallery on Saturday, December 14 for a fantastic holiday event featuring some great local artists (including myself!). And with free entry, door prizes, hot chai & cookies, you really can't go wrong!